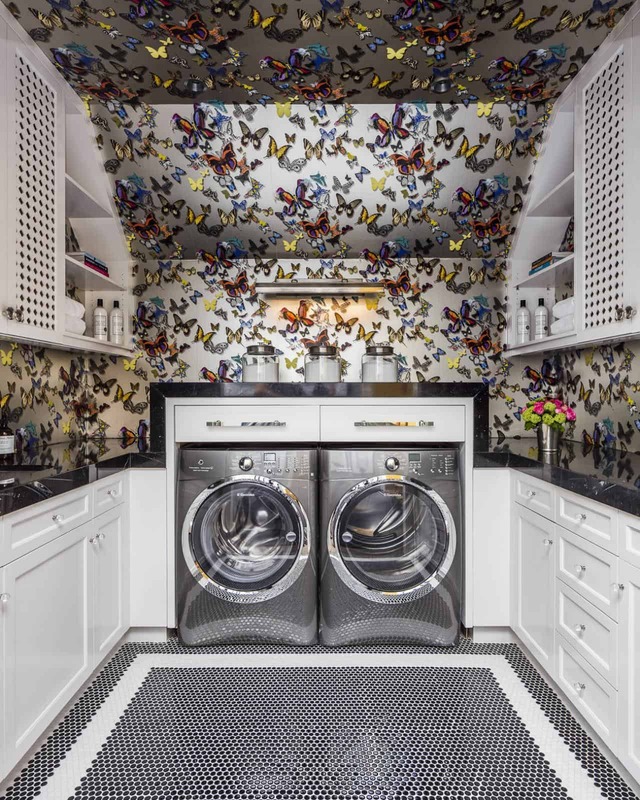 Many may say the kitchen and the bathroom are the most used spaces in a home, however, in all actuality, the laundry room will get the most use. If you are lucky enough to already have one in your home, it may be time to get it a quick makeover to bring your space back to life will make it feel bigger. 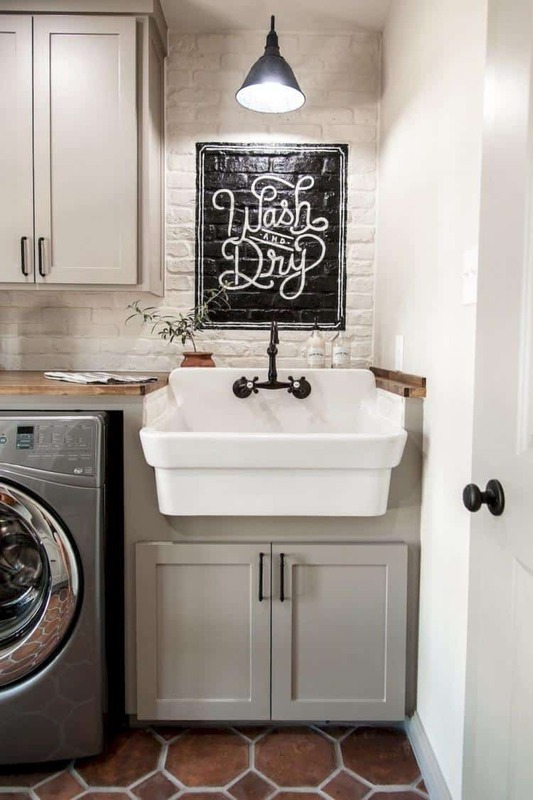 Here are a few chic small laundry room ideas that will inspire you. Bold colors are not for everyone and that is okay, as decor is personal to the homeowner. 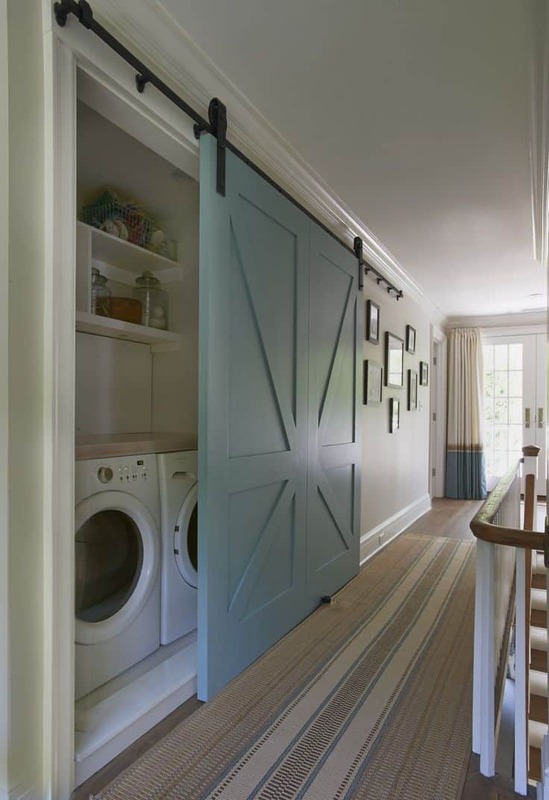 However, if you want to add color to your laundry room with your barn doors, consider using a light pastel hue instead. It will add color and appeal while still being soft in the room. 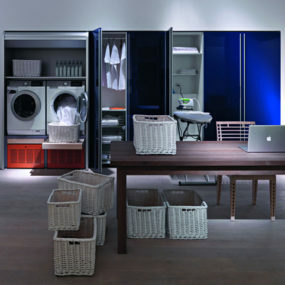 Many times, when you have a laundry room, its doors tend to be an afterthought. But as of recently, we have come to love the idea of making it a staple. 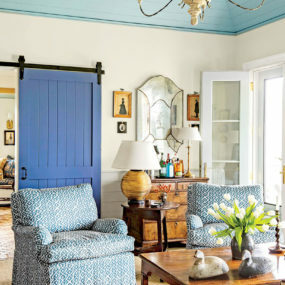 Change up your traditional doors to barn doors with a pop of color. Paint your barn doors a vivid hue such as orange, green, red, and/or blue for that classic beauty. Your guests will be mesmerized by the color while wondering what treasures hide on the other size. Sky blue is one of those versatile hues that work in every space while adding a feminine touch. The key is incorporating bits of white to allow the decor to come together. Prevent your small room from feeling cluttered by creating a whimsical, charming oasis. 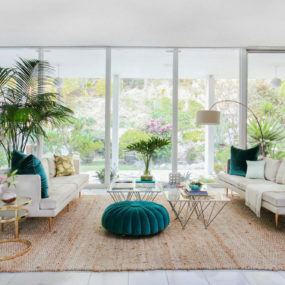 In order to create this oasis, you want to add hues of sky blue paired with shades of white to create the perfect balance. You may even want to incorporate a bold wallpaper with multiple different shades of blue for a rich contrast. 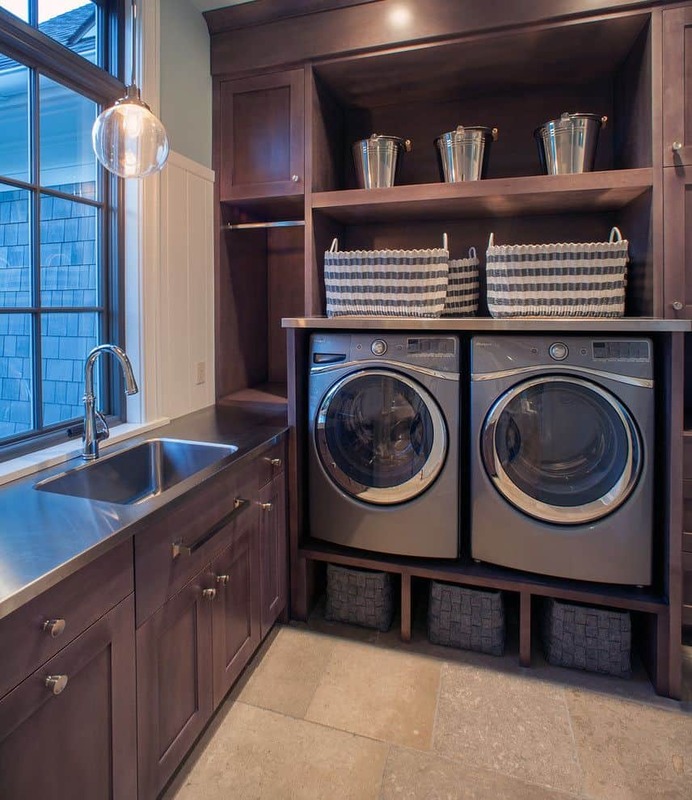 A masculine laundry room is one of the easiest forms of bringing elegance to a well-used and well-loved space. The darker hues paired with rich brass shades and metallics bring a “lived in” appeal that is almost too good to pass up. For a masculine elegance, you want to use darker hues and pair them with brass-like metallics. 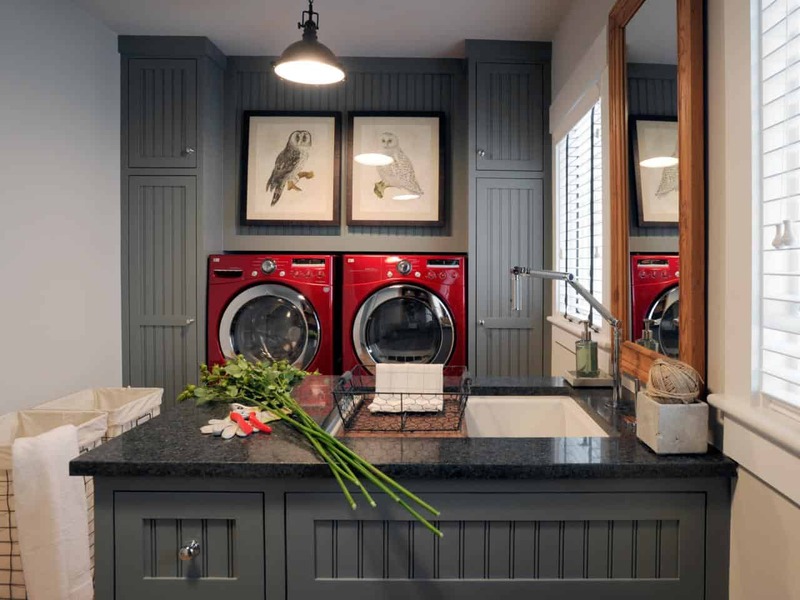 We love the idea of tucking your appliances away in a cupboard and/or wall storage for a classic aesthetic while still having everything you need. Open shelving in the perfect way to take advantage of a smaller space as you can remove some square footage and display it on the walls instead. Consider using neutral or clear wall shelves to expand on the space without compromising the colors used. 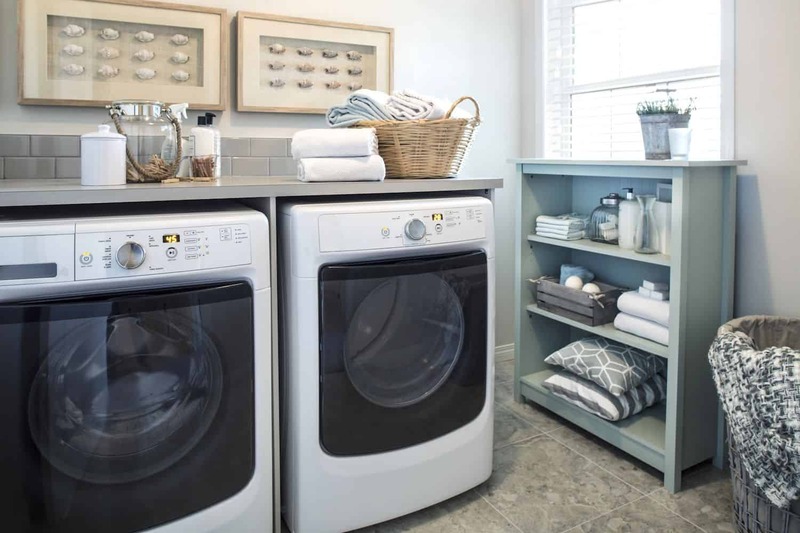 Open shelving is the perfect complementary addition to a laundry room because it gives you an airy feel while having everything you need at the tip of your hands. The key is working with numerous open shelves throughout the room to have that openness that expands the space without taking away from it. 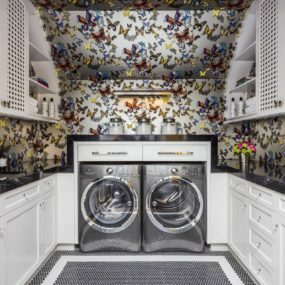 What better way to add pattern than to fill your laundry room from top to bottom in an extraordinary wallpaper that offers not only a repetitive pattern but a seamless one as well. Keep the rest of the space as simple as possible to not take away from the richness of the wallpaper. 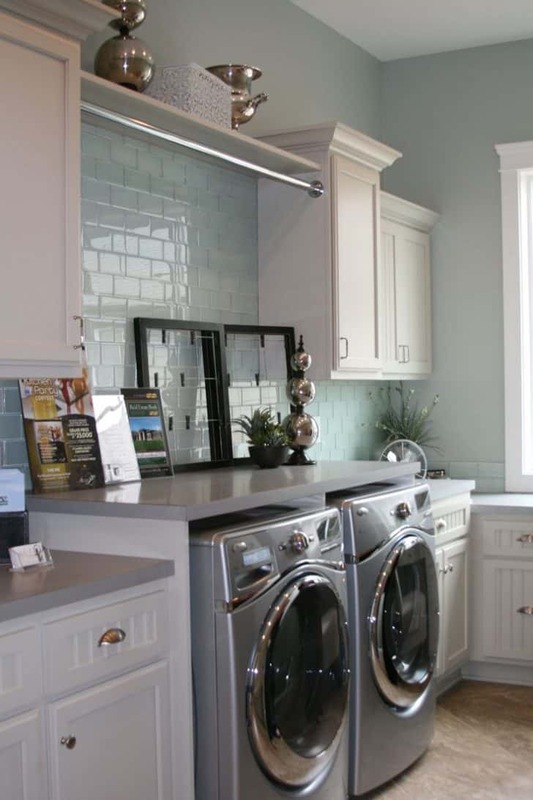 The laundry room shouldn’t feel like an “extra room” it should feel like another addition to the home. Therefore, what better way to bring a pop of beauty to a simple room than by adding mixed patterns in. Use patterns with similar colors to bring it all together. 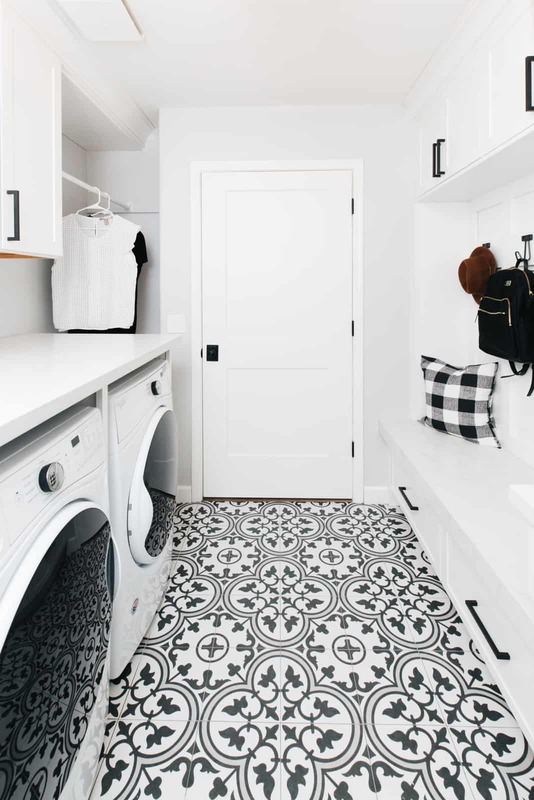 We love the idea of a rustic laundry room because many have a wash sink which makes it easier to remove stains and wash clothes directly in one space. Pair with wooden features and paint them for a more modern feel while keeping the wooden touches traditional to their aesthetics will have a more classic appeal. Rustic has always been a top favorite decor option due to its simplistic manner. Use neutral hues and add wooden bits for a classic rustic touch, that brings the room back to life. 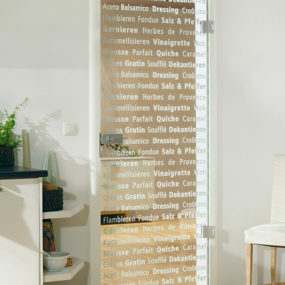 This is perfect for smaller rooms due to its expanding feel. The tiling on your floor can be the main focus in the space when it is laid out in a perfectly symmetrical manner. The key is working with neutral tones that pack a big punch yet are simple enough to feel part of the decor. Use a repetitive pattern for the best outcome, you may even want to use bold color. Bring on the pops of color, with tiled patterned flooring. Tiles make any space better, especially when they are laid out in a fun display with bits of color. Choose an intricate pattern and work with colors that are simple to allow the flooring the focus it deserves. 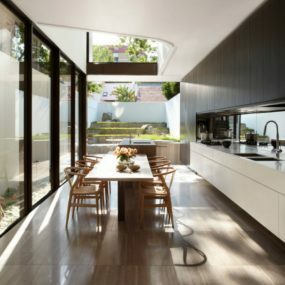 High tech appliances can be exactly what your space needs, not only do they tend to be more compact but they do more in a shorter amount of time. Add functional bits around to make the space more useful and put together. Additionally, you want to add color in the space for a modern twist. Why settle for traditional appliances when you can use high tech appliances instead. 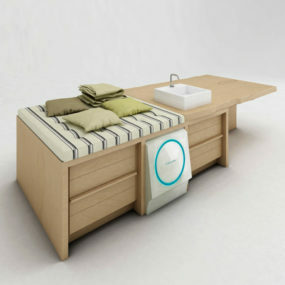 High tech appliances have the versatility to be smaller in size while doing a lot more all at once. Additionally, you may consider mounting your appliances one on top of the other for a more compact appearance. 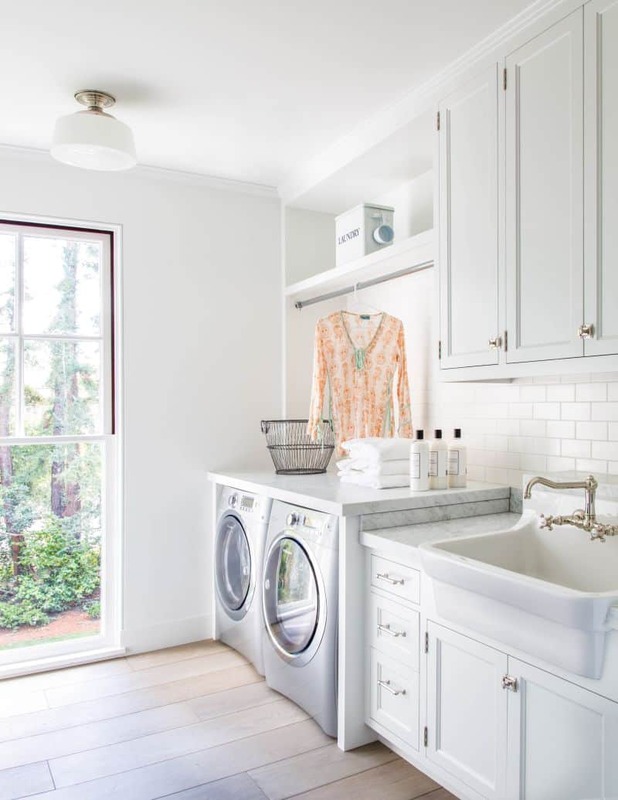 Charming white is one of your favorite decor options for the laundry room. It just looks sleek and clean while being versatile. The key is working with bits of metallic touches for a modern appeal. What better way to expand on the space than to use crisp shades of white. White is not only expanding, but it adds to the appeal that the space is extra clean. A pop of color comes in multiple different forms. If you have a modern space with little color a pop of red could be just the right hue for the space. The key is working with a color that packs a punch, and brings direct focus to it while working with the color selection you already have. If the space feels a bit “boring” or less modern, you may be in need of color. Adding pops of color throughout the space is an excellent way to upgrade the area while still keeping the integrity of the main decor. 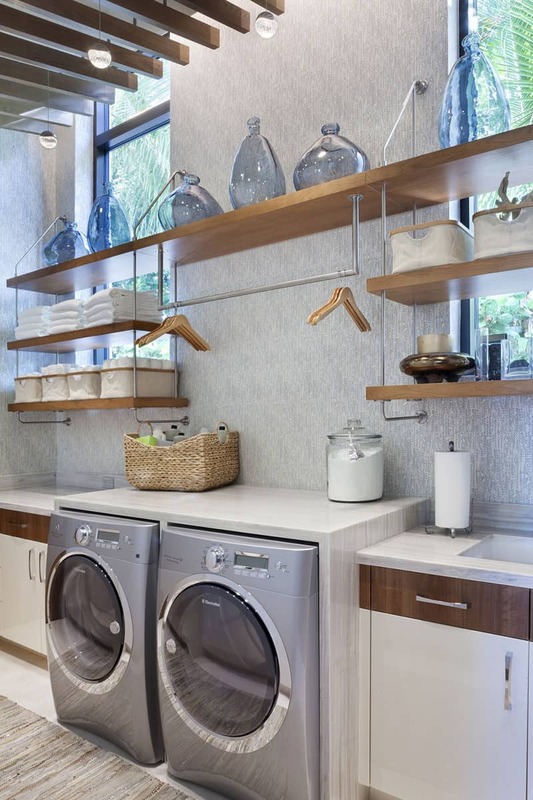 Give your laundry room an upgrade with one of these ideas. Which of these is your personal favorite? Please share with us your thoughts below.